We’ve been sharing ghost stories from our team all week, which we think shows just how haunted our 1000 year old buildings are! If you weren’t scared by our previous ghost stories, perhaps this one from Mr Jenkes will spook you. Mr Jenkes divulged an intriguing tale of a tour he once took, in which one of the visitors had a guide dog with them. This dog was perfectly happy in the area at the base of St George’s tower, however, when it came to entering the crypt he showed great reluctance and stopped dead at the entrance. On finally being coerced in he started to whine and growl at something, then suddenly he broke out into wild barking, the noise reverberating throughout the crypt, before darting back up the stairs into the safety of the shop. Whatever the dog sensed down there, he definitely didn’t like it and the rest of the tour group were certainly spooked too. 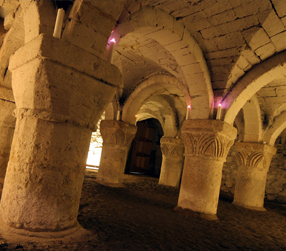 Come and experience Oxford Castle at the spookiest time of the year, Halloween! Read more about our Ghost Fest events here.